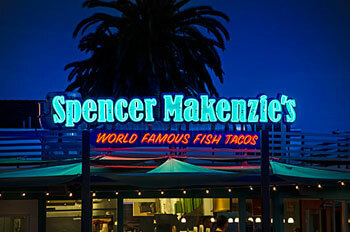 Reverse Channel Letters are a great way to bring a more nuanced approach to signs designed to catch the eye. While this type of signage still employs electric light to ensure visibility in the dark and to draw attention, the light is installed on the reverse side of outward facing signage in such a way that it is projected onto the surface behind it. This type of ambient light has a softer appeal, less harsh than neon and easier to read than light projected onto a flat sign. Bombay Bar & Grill located in downtown Ventura, CA. Reverse channel letters are customizable in a variety of ways because there are more variables and elements of choice associated with them than with ordinary signs. The sign’s face is the most standard element, which is usually designed in accordance with a given brand’s custom fonts and colors. Moving beyond the face of the sign is when design starts to come into play, with several elements to consider. “Return” refers to the sign’s depth, and can range from 3 to 8 inches. Often, the dimension of reverse channel letters signs’ returns will depend on more than just design: lease agreements or local ordinances may dictate the type of return that is appropriate for your sign. Rice Thai Cuisine located in downtown Ventura, CA. The other major variable in a reverse channel letter sign is the light source. Modern iterations of these signs will almost always include LED lights as opposed to neon, but both the color and intensity of the light is completely customizable. Using light projected onto the surface behind the sign produces a halo effect, centering the viewer’s attention on the letters surrounded by light. Shanghai Beer Garden formerly located in downtown Ventura, CA. Dave’s Signs has a well-established history of customizing and creating reverse channel letter signs for a variety of clients and purposes. To learn more, or to begin planning your reverse channel letter sign today, give us a call at (805) 641-1387 or reach out to us online.